Can You Fight Off a Police Dog?	" So I’ve got some solid advice for you. When it comes to running from a police dog, don’t do it! You will never win the race. I have had many clients come in a bit chewed up after trying to out-run the dogs. You may out-run the police (or so you may think) but you don’t stand a chance of escaping the brunt of a four-legged officer unless, perhaps, you’re Usain Bolt. But even that is still debatable. Police canines are trained to chase and hold down suspects until their handler arrives. The dogs will “bark and hold” until a suspect is apprehended and it’s at this point that fuzzy paws are replaced with the cold metal of handcuffs. However, decide to run and the dog’s sophisticated training and a bit of wild instinct take over. They are faster, stronger, and smarter than you! Take it from me–surrender. You’re going to jail either way. It’s only a matter of whether you want to stop by the hospital first. 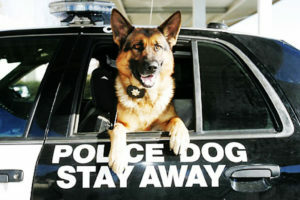 Original article: Can You Fight Off a Police Dog?